The Patek Philippe Nautilus reference 3800 is the versatile watch par excellence: sporty yet chic, owning to its smaller 37.5 mm compared to the 42mm diameter of the original reference 3700. 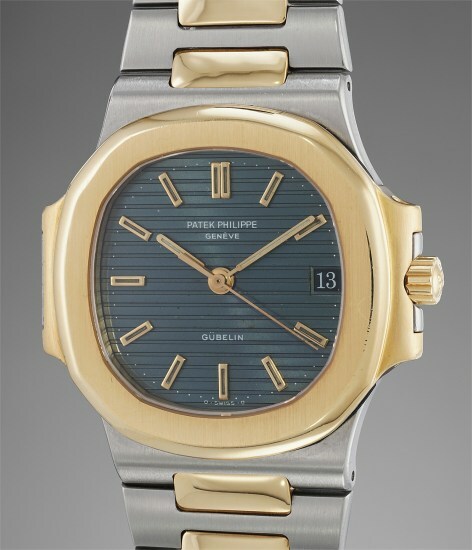 Released in 1981, reference 3800 remained in production until 2006, during which the movement presented several evolutions. Early models feature caliber 335 SC without the quick set date feature through the crown. Such development was introduced in 1987, while keeping caliber 335SC. In 1992 a third generation was introduced featuring cal. 330 134, and finally cal. 330 194 was employed for the pieces made from 1997 to 2006, year of discontinuation. The present glamorous steel and gold version features an incredibly attractive dial that has turned petrol blue with time highlighted by the milk chocolate color of the indexes and hands. The dial is furthermore graced with the presence of the rare Gübelin signature on the dial indicating that it was originally retailed by Gübelin, a prestigious Swiss-based, family-owned, jewellery and watch retailer founded in 1854. Research shows that this is the second reference 3800/1 in steel and gold to appear on the market bearing the Gübelin signature making the present watch an exceedingly rare example. The elegant two tone case, the incredible color of the dial along with the rare Gübelin signature renders the present Nautilus an opportunity not to be missed by shrewd collectors.